I’ll Have Another looked like just another horse at the Kentucky Derby. That’s when the chestnut colt – sold for a paltry $11,000, ridden by a rookie jockey hardly anyone knew and stuck in an outside post – blazed past highly regarded Bodemeister to win by 1 1-2 lengths on Saturday, beating one of the deepest fields in years. I’ll Have Another stormed out of post No. 19 – the first winner from there in 138 runnings of the Derby – and bided his time back in mid-pack while Bodemeister set a blistering pace on a muggy, 85-degree afternoon at Churchill Downs. Making his Derby debut at 25, Gutierrez got his chance to ride I’ll Have Another after trainer Doug O’Neill and owner J. Paul Reddam happened to see him at Santa Anita in Southern California. It was another chapter in Gutierrez’s unusual route to the Derby winner’s circle. He followed in his father’s footsteps as a jockey, getting on quarterhorses in Veracruz, Mexico, at 14. After a stint in Canada, he eventually started getting noticed on the West Coast, especially after winning the Santa Anita Derby last month. “Top trainers, top owners, of course, they’re not going to know anything about me,” he said. Still, Gutierrez was largely a mystery to the record crowd of 165,307, who didn’t know 15-1 shot I’ll Have Another or the jockey had the right stuff until the 20-horse field turned for home. That’s when Gutierrez, who moved up between horses around the final turn, positioned his colt not far from the rail and set him down to run. I’ll Have Another overhauled a tiring Bodemeister to win by 1 1-2 lengths. He paid $32.60, $13.80 and $9. He ran 1 1-4 miles in 2:01.83. Bodemeister, trained by three-time Derby winner Bob Baffert, was second and returned $6.20 and $5.60 as the 4-1 favorite. Dullahan was a neck back in third and paid $7.20 to show. O’Neill didn’t waste any time vowing that I’ll Have Another will go on to the Preakness in two weeks. “Maryland, here we come, baby!” he said. They’ll go to Pimlico as one of the favorites as a result of I’ll Have Another’s Derby win and his catchy name. It has nothing to do with alcohol; it’s Reddam’s response to his wife’s nightly query of “Do you want any more cookies?” as he lounges on the couch. It’s an offer the portly Reddam rarely refuses. I’ll Have Another made his way to the starting gate accompanied by his stable pony, Lava Man, another cheap purchase turned into a career winner of more than $5 million by O’Neill. The trainer has made his name predominantly in Southern California, although he’s won three Breeders’ Cup races. A hot pace was anticipated from speedster Trinniberg, although, surprisingly, it was Bodemeister under jockey Mike Smith who bolted to the front and forced Trinniberg to take a backseat. In the late afternoon heat, Bodemeister set impossibly fast fractions. He ran the opening quarter-mile in 22.32 seconds and the half-mile in 45.39. Meanwhile, I’ll Have Another was comfortably galloping along behind the speedsters. Gutierrez angled his colt clear on the final turn and took dead-aim at Bodemeister, who was clearly in front at the top of the stretch. 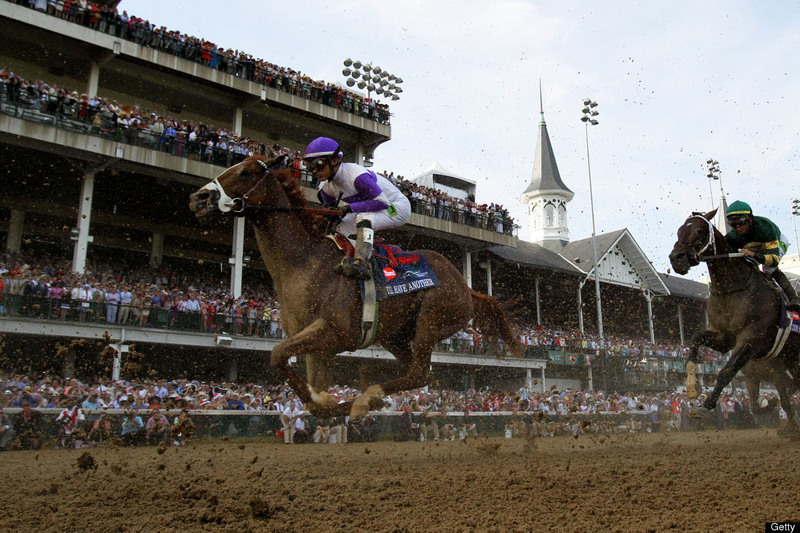 “I knew we were in trouble when I saw Doug’s horse coming,” said Smith, who won the Derby with 50-1 shot Giacomo in 2005. Union Rags, the 5-1 second choice, never had a chance. He got pinched at the start and was trapped between rivals. Gemologist, the 8-1 third choice, lost for the first time in six starts, finishing 16th. Hansen, the Breeders’ Cup Juvenile winner and 2-year-old champion, faded to ninth. Went the Day Well finished fourth, followed by Creative Cause and Liaison. Rousing Sermon was eighth. Daddy Nose Best was 10th, followed by Optimizer, Alpha, El Padrino, Done Talking and Sabercat. Trinniberg was 17th, followed by Prospective, Take Charge Indy and Daddy Long Legs, who was last. Did the Miz and R truth Really get fired? Next: National Christmas Tree in White House Has Died! Parody of Justin Bieber's "Boyfriend" Goes Viral! Newton wins Heisman in landslide!